Konokchura (peltophorum pterocarpum, family : fabaceae) is a medium-sized deciduous tree with profuse foliage, reaching up to 18 m in height. Its main trunk is steep, gray and smooth. The branches are divided into many parts, densely adjusted and shadowy. Dark green leaves are small, elliptic, pinnately compound, rachis 30-45 cm long. In summer, full canopy cover with yellow flowers. Flowers are brilliant yellow, clustered on terminal inflorescence. Sepal 5, petals 5. Flowers are very fragrant. The fruit is flattened, copper-colored, a lot like a shield, long lasting. Propagation of the plant is caused by seeds. Saplings can be easily made from seeds. Shegun or Teak (tectona grandis, family : verbenaceae) is a lofty deciduous slow growing tree up to 25-30 m of height with few branches at the top and fluted trunk at the base. 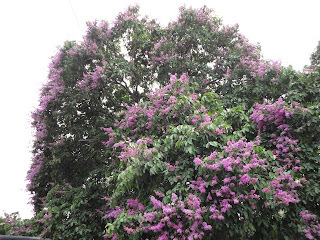 It is a tree of South and Southeast Asia. The tree is highly valued for its superb timber used to make different kinds of furniture. Teak is one of the best woods in the world. Like other countries it is planted as a ommercial tree in Bangladesh. However, it is also planted in the park, botanical gardens as an ornamental tree. The beautiful tree can be planted by rows on the highway. In winter it leaves its leaves completely. New leaves grow in the beginning of spring. Leaves are opposite, broadly elliptic, pointed at the end, 20-70 cm long, green, rough above, yellowish beneath, hairy. In the rainy season, white-colored and fragrant flowers cover the entire canopy. Flowers are small, borne on the large terminal panicle. Panicle is seen to be 1-3 feet tall.